I posted something about this over the weekend when I made it, but I thought it would be good to tell you a little more here. 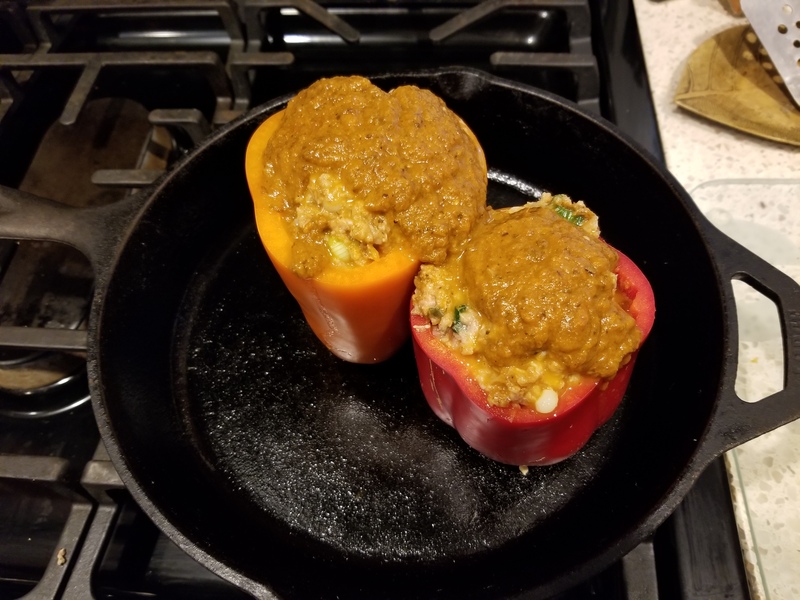 For the first time, I made stuffed peppers. It’s indicative of the fact that I eat a lot of things these days that I never would have eaten years ago. I also like trying to cook things I’ve never cooked before. For evidence of this, I refer you to the Recipes! section of this blog. We took all this and mixed it in a bowl, then divided it in half and stuffed two bell peppers with the mixture. Over the top, we poured a tomato-based sauce– this was made about a week earlier, from fresh and frozen vegetables, and helped along by a little chicken stock, a lot of basil, and some tomato paste. I cooked them for about 30 minutes at 375 degrees fahrenheit (190 degrees celsius). After 30 minutes, I took them out and added freshly-grated cheddar/gruyere cheese (from Trader Joe’s) to the top. Then they went back in for almost another 15 minutes. I can tell you with certainty that they tasted as good as they look. 2) Share your discoveries. Some of my favorite recipes are from ideas I got from someone else. I hope you get a chance to experiment in the kitchen and discover something fun and different. 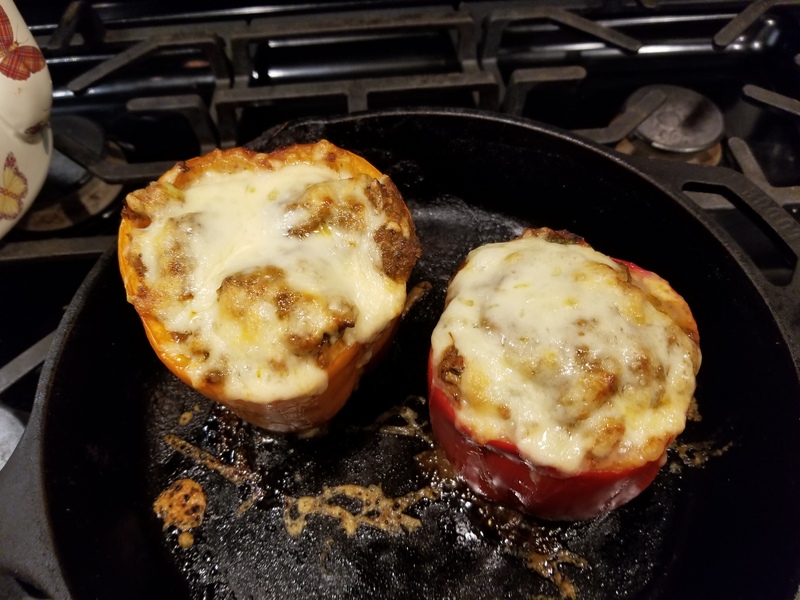 Until then… enjoy the stuffed peppers! Renza was at the annual ATTD Conference in Berlin, and she had likely been watching various presentations from companies showing their latest D-tech developments in beautiful, asthetically-superior ways with beautiful, asthetically-superior people. Hence Renza’s tweet. It should be no secret that the outward message about diabetes, from technology companies, drug companies, and even non-profits, tends to be positive. 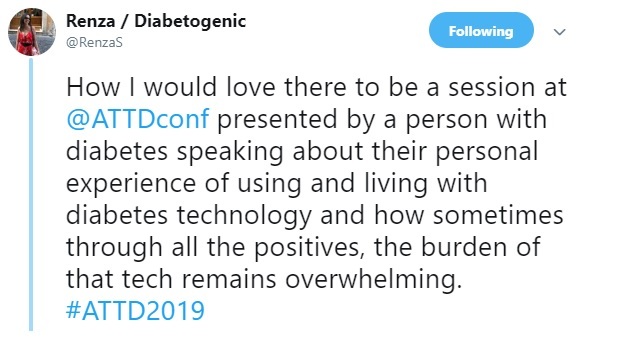 I don’t think I’ve ever seen a Medtronic, Tandem, Dexcom, Abbott, Eli Lilly, Novo Nordisk, Sanofi, or even JDRF or ADA ad or presentation showing someone dealing unhappily with the day-to-day existence of a chronic condition. The most obvious reason for that is because it’s not pretty. The second most obvious reason for that is because it’s hard to explain the burden of living with diabetes. The thing we need to continue to do is tell our story. No one can explain the feeling I have when late night diabetes attention is required better than I can. Insulin affordability issues? Listening to people tout their cinnamon okra yogurt cure? Day after day of early morning highs or early morning lows? We’re the ones who experience it. We’re the ones who should talk about it. No one will know what it’s like unless we show them what it’s like. There are plenty of things that add to the burden of living with this condition. If they can’t show it in their presentations, I want groups and companies to at least show me how their product or their initiative can help reduce the burden of living with a gusher when performing a set change at work, a failed CGM sensor, and the fear of dying in our sleep. We, the people living with diabetes, are in the best, perhaps the only, position possible to share this and get non-profits, corporations, and academics to acknowledge and include burden as a factor in their public-facing material. Yes, of course we can be successful, happy people even after a diabetes diagnosis. But our lives are not the same every day, and there is often a fair amount of bad in addition to the good of living with this disease. No one should ignore that, or try to put it into a convenient corner for us to talk about when everyone has left the building. Including us. Especially us. So… maybe you’re active, very active on social media. Maybe you have a child with a popular Instagram account and YouTube channel. As a result, you or your child (or both of you) are constantly checking your phone, looking at reactions and statistics related to your various social media endeavors. Which often leads to statements such as, “If only I (or my child) would be as diligent with my/their diabetes, I/They would be doing great!”. Well, I have a confession to make: I am that obsessive about my diabetes. 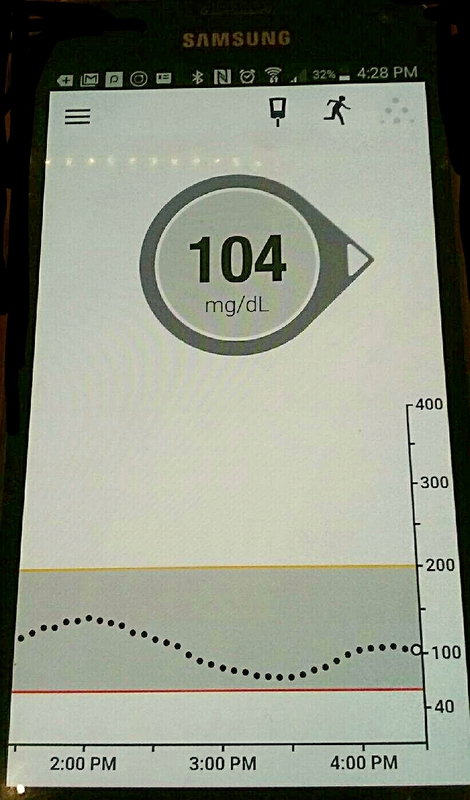 Thanks to the Dexcom app on my phone, I’m watching what my blood sugar numbers are doing all day long. And I’m making adjustments to diet, activity, and insulin dosage based on those numbers. It’s only natural that when you first start wearing a continuous glucose monitor, you’re inclined to find out what your glucose is doing continuously. I mean, you’re checking your phone or your receiver every couple of minutes. I’m not checking every couple of minutes anymore, but I have to admit that I’m checking my phone about every ten to fifteen minutes throughout the day. And I’m not always looking at Facebook. I want to see those BG numbers and take action if necessary. I did it when traveling this week. It’s no secret that when encountered with a different location and restaurant food at nearly every meal, your trend line can go up and down like a Space-X rocket shooting another satellite into space, then landing to earth. That’s exactly what happened on this last trip. And the only way I got through most of it was by obsessing over the numbers and the trends all day long. I should mention, however, that I didn’t stress too much about what was happening at any given moment. I just wanted to know where I was and where I was headed so I could take appropriate action if I needed to. In my case, knowing the number and the trend gives me power to manage my diabetes, even in the most unfamiliar of circumstances. In the end, we all have to decide how much blood, sweat, and tears we want to commit to maintaining the healthiest version of ourselves. Even though it took me a long time to get comfortable with the idea of wearing a CGM, I’ve now found it to be an indispensable part of my diabetes life. I need something to take my mind off of my responsibilities today, so I thought it might be fun to revisit this blog post from January 2013, titled 48 Things that make me… Me. This had originally appeared in my Facebook feed from Cherise Shockley, a lot of others picked it up, and I thought it would be fun to do too. I can’t believe it was over six years ago. This time, I’m going to include the original answers from 2013, and my new answers (if there are any) in blue. Feel free to play along on your own social media channel. Here we go! When was the last time I watched “It’s a Wonderful Life”? Probably the last time I saw my prescription co-pay for insulin. I have great penmanship… don’t try to decipher my note-taking, however. I still have great penmanship, but my chances to use it are fewer and fewer every day. Is pit beef a lunch meat? Then YES. That’s my favorite. I’ve become quite fond of black forest ham lately. No kids. Always wanted kids. Still no kids. Will never have kids. Wish I had kids. Yes, of course! ‘Cause I need all the friends I can get. I’d like to think I’m a better friend than I was six years ago. I certainly hope so. Oh, you want to talk politics now? Do I use sarcasm a lot? Is the president hopelessly devoted to his wife? No! Tonsils removed when I was four years old… in 1966. In those days, they had you stay in the hospital for like five days after the operation. I still remember it. Creepy. Despite the fact that tonsils can grow back, mine haven’t, so… No. I am sooo afraid of heights. But I would bungee jump. I like to confront my fears. And scream my head off through the whole process. The screaming releases the fear. Raisin bran. Plain enough for you? Really, I never eat cereal. During the winter, I eat a lot of grits for breakfast. Sometimes, with black forest ham in there. This requires a “body of evidence” answer. If you asked me if I feel strong right now, I would say no. If you asked me if I’ve been strong over the last 22 years with diabetes, the answer is definitely YES. Physically, I’ve been through a lot in the last few years. The fact that I’ve survived it does not indicate that I’m weak. From the store: Edy’s rainbow sherbet (monster high carb effect, by the way). And Trader Joe’s pumpkin. So pumpkin-ey. Specialty brand: Black Cherry from Graeter’s in Cincinnati. I also recently fell in love with Graeter’s seasonal Cinnamon ice cream. Whether they’re open or closed. Will you talk and be nice even if we seem to be different on the surface? I can usually tell within ten seconds. It’s amazing how some things don’t really change that much. Other than an occasional button-down oxford dress shirt, I never much liked pink. That I’m getting older. Can’t do anything about it, so I don’t think about it much. These days, I don’t like what I see when I look in the mirror. I’m wondering if I can ever get that old (short) swimmer’s body back. All of my nieces, nephews, great nieces, and great nephews. Kids are still our future and worth every effort we can make for them. Even if some of them aren’t kids anymore. Add in all Diabetes UnConference alumni. Gee, I haven’t missed a meeting in years. These days, I think I need to work harder at saying No to some things. Simple black dress shoes. Honed to a bright sheen. Sturdy brown waterproof work shoes. Pretty casual compared to 2013. Grits and turkey sausage for breakfast this morning. Oui by Yoplait black cherry yogurt. Surprised? Buckwheat Zydeco Radio on Pandora. Didn’t see that one coming, did you? My listening is all over the map these days. Sinatra, Motown, jazz, opera, and yes, zydeco. I’m a musical melting pot. I’m leaning toward the indigo at this point. Today, when I’m driving and I catch the scent of a good barbecue joint, I will almost always stop. Important enough that I care deeply, not important enough to hurt someone over… figuratively or literally. This is a loaded question in 2019, isn’t it? I think the old rules still apply though. It’s been a hard winter. Send me to the beach. Baseball on a summer day or night. Horse racing on a spring day or night. Both offer long periods of inaction punctuated by amazing moments of thrillage. I read something like that somewhere. With increasing amounts of gray. Plus, a skin condition has made it so my eyes are almost permanently bloodshot. Nope. Glasses. When I can find them. I’ve never worn contacts. Inserting pump infusion sets and CGM sensors are enough for me. I’ve had a real fondness lately for flatbread pizza too. Men in Black 3. First straight-to-video movie I’ve ever watched. Same story… different characters. Casablanca. “Of all the gin joints in all the towns in all the world, she walks into mine”. Though he’s so cruel and bitter in that scene, in my opinion, it’s Humphrey Bogart’s best work. Your average plain white dress shirt. With a sensible green tie. Sounds worse than it is. Blue, to support everyone living with and affected by diabetes. I’ve been so cold this winter. Key Lime Pie. Or Cherry Pie. Or just Pie. Or Baklava. Basically: If it’s made with dough, yes. If it’s made with cake, no. Cardio, with just enough strength training now and then to keep me honest. In a nutshell, that’s me at the gym. Slowly but surely moving from the television side over to computer. I am this close to cutting the cable. One Shot at Forever: A Small Town, an Unlikely Coach, and a Magical Baseball Season by Chris Ballard. I need a “no-thinking” book now and then. I haven’t read a full book in a while. Too busy reading the news every day. That question is so 90’s. I don’t need no stinkin’ mouse pad. Can we retire this question already? Add in the sound of laughter, which has been sorely lacking in America since the 2016 election. I love all music. When it’s played by actual instruments. And not lip-synched. I’m coming around to some alt-rock. Don’t have much use for “today’s country”. And if you need twenty dancers on stage with you while you sing your song, you’re an entertainer, not necessarily a singer. Kilkenny, Ireland, 2004. Such wonderful, friendly people. I visited Brussels, Belgium for three fabulous days almost four years ago. The same statement applies… wonderful, friendly people, living in a beautiful city. Ahem… Yes. Yes I do. You can’t erase talent, can you? Cincinnati, Ohio USA on April 9, 1962. Reds Opening Day, and my father had to give up his ticket. They lost anyway, Dad. Someone, somewhere, made a lot of money saying you can’t change where you were born. Baltimore, Maryland USA since September, 1994. Just your average brick Cape Cod. Lived in the same home for almost 22 years. I don’t know if we’d have ever made it here, if not for the property tax and mortgage interest tax deductions that homeowners don’t get any longer. I have a bright red truck. I miss my truck every single day. But now I have a nice green-ish Ford with a sleek interior, a sunroof, and a peppy turbo engine. These 48 questions are fun. I’m not sure I’d like 48 questions about my job. A lot has changed in six years. And I’m okay with most of it. Thanks again Cherise. Just like last time, this has been a good exercise to help clear my mind. One of the surprising things I’ve found out about myself while interviewing people for Diabetes By The Numbers is that I’m one of the worst pronouncers of names I’ve ever met. That’s horrible, especially when I have a guest as special as Renza Scibilia. 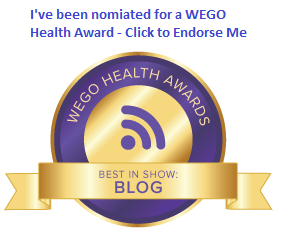 Renza is a diabetes superhero worldwide, with her blog, her work for a large diabetes organization in Australia, and her presence at the forefront of the most important issues facing all of us. After Renza gets me straightened out on the correct pronunciation of her last name, we talk about the upcoming ATTD conference in Berlin, the importance of #LanguageMatters, and how critical the Spare a Rose campaign is. 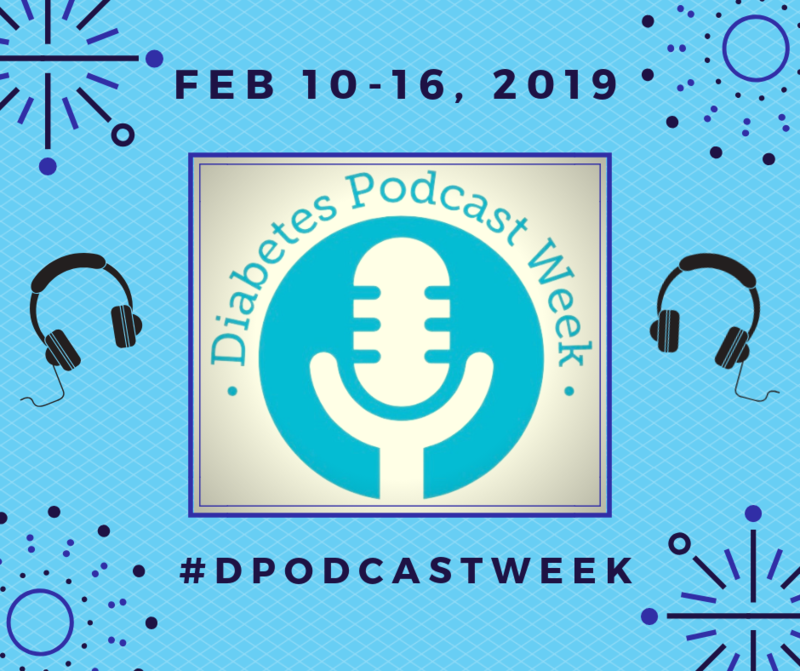 Which is timely, because this episode of Diabetes By The Numbers is part of Diabetes Podcast Week, February 10 through 16. All of the podcasters and video bloggers are throwing their efforts this week behind the Spare a Rose, Save a Child campaign through the International Diabetes Federation’s Life for a Child program. As I’ve mentioned before, the cost of one rose (about $5 USD) saves the life of a child for one month. The cost of a dozen roses gains a child in another part of the world an entire year to play, go to school, and be with their families. Who doesn’t love that? There are children all over the world who are depending on us. So please, take time right now. Click on the link below and share it with everyone you know. And now… here’s Renza!